Mauser M 84/98 carbine. Serial number 0407 gg on ricasso. Crudely made phosphorized finished fullered blade. German maker's name and date in code 44 ASW (= E.& F. Hörster & Cie, Solingen 1944) on ricasso. Very good phosphorized finished pommel and crossguard. Flash guard. Single German marking on pommel. Excellent reddish bakelite grips secured to the blade by two rivets and not by screw bolts! Very good phosphorized finished metal scabbard is marked 44 ASW and serial number 0596 a. No matching serial number, but both scabbard and bayonet are phosphorized finished and marked and dated ASW 44. 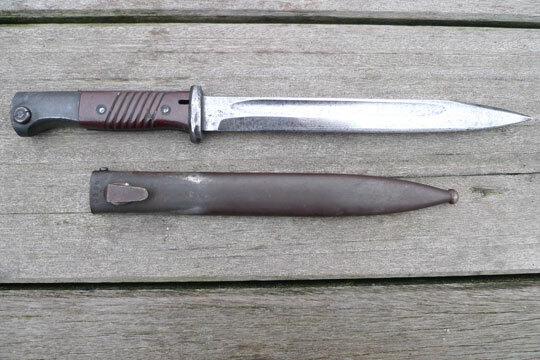 Extremely rare German 84/98 bayonet made by ASW in 1944. Also called Grey Ghost by collectors, be course ASWE only made 3.000 phosphorized finished and riveted bayonets by the end of the war in 1944! Seldom encountered.